Do you ever find yourself so wound up with to-do lists and responsibilities that you forget to pause and consider how God feels about you? May this beautiful coloring book remind you once again of His love and purpose for your life. Take a moment each day to read a soul-stirring blessing and a short passage of Scripture to point you back to God's timeless truth. Then, unwind with lovely, intricate illustrations that bring God's wonders into focus. Read, rest, and create as you soak in the beauty of God's love. "May your day be filled with sacred moments that remind you just how precious you are to Him." 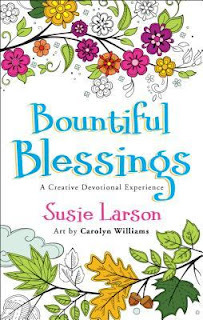 Susie Larson is a popular radio show host, national speaker, and author known for her biblical teaching and passion to see people strengthened in their faith. My thoughts: BOUNTIFUL BLESSINGS: A Creative Devotional Experience is really a book of blessings with lovely pictures to color. The artwork is spectacular and I wanted to sit down and color some of them right away. I read through the entire book in one sitting (only about 96 pages) and I enjoyed the blessings. There's really no meat, but if you read them slowly, do one a day, and meditate on the verse and blessing as you color it could be restful, peaceful, and lead to praying. This would be a lovely gift for woman for mother's day, a birthday gift, or a just because you're special to me gift. I'll probably keep my copy with a stack of books i have for stressful moments when I can't focus on a fiction or nonfiction book, but need something to keep my mind occupied -- God's word is perfect for that -- and use it as a prayer starter. A truly gorgeous and inspirational book. Love it. Another gift idea for women. Thank you for sharing.